Hello Joy and welcome to Jaffareadstoo. Thank you for spending time with us today. EXPECT THE UNEXPECTED in my debut novel, Untangling The Webs, a cliffhanging mystery relationship thriller, concerning four women of varying ages and background. Their parallel lives deal with toxic behaviour, unexpected emotional shocks, treachery and grief. Having to show grit, and aided by the common thread of a close female `rock', each struggles to overcome huge obstacles assailing them, untangling strong threads of mystery, intent on achieving joy again. Lost letters found four years after Trudie’s married lover, Laurie, disappears without trace, offer a few clues, but a serendipitous discovery in a Cornish church reveals vital information, if Trudie is brave enough to act upon it. Alison has to deal with repercussions from unearthing vicar Henry’s and police inspector Phil’s mendacious betrayals, before meeting lovely Stephen. Her discovery of Julia’s husband David’s deep secret, breaks the impasse of her friend’s stressful situation. Phoebe’s cossetted life appears idyllic, but her late husband’s previously out-of-bounds den holds a breathtaking shock, needing Alison’s help to solve the enigma. Set mainly in Cheshire, the novel dips into Worcestershire, Cornwall, Cumbria and Provence. It is available from myself, Amazon, Waterstone’s, independent bookshops. My details are on Facebook as Joy Pearson Author. Tell us a little about yourself and how you got started as an author? As an imaginative observant child, my confidence to write had been knocked by my adoptive mother, who threw my poems and short stories into the fire, informing me I was useless and so were they and I would never amount to anything From that time onwards, I wrote in secret, becoming a vigilant observer of both people and atmospheres. I have had two life-threatening incidents in my life, the second of which made me so thankful to still be alive, that I resolved to make every day count after that. The incident was in Jerusalem, where a friend and self went to both a Shabat dinner with wealthy ex-pat Mancunian Jews and the previous day to an Israeli run camp with 1200 Palestinian people living. One doctor and limited time allowed out for school. We were with the social worker for the camp, who had been shot in the leg on four occasions by the soldiers in the watchtowers and in prison for nothing. After only half an hour drinking lemonade with him and his family, we heard gunfire, having to hide behind sofas. Having heard their point of view and promising to report their plight, we left. The problem began when we were seen from the watchtower, getting into our hire car which had Palestinian number plates. A prime target, our car was hit twice, thankfully not on the tyres, so with my friend zig zagging out of the open gates and myself ducking down into the passenger seat, we made our escape. Have I made every day count since then? Mostly, but life attacks us doesn’t it? Work, children, divorce, money worries, deaths, relationships, menopause, and general stress of our complex lives. However, having learnt the internet, stressful in itself without someone on hand to advise on its vagaries, I subsequently turned to Word. I clicked on it and began to write, delete, attempt to copy and paste, eventually successfully, so wrote my autobiography from aged three to 2008, with joys, sorrows, difficulties and triumphs recorded. A bonus in case I make old bones, but forget. In 2008, I began, with experience gained from this, to write my novel. I had a vague idea of who my characters might be, but no idea who they might morph into. I knew that I wanted to convey parallels in people’s lives, despite totally different backgrounds. Knowing how much the support of a close friend can bring to one’s life and vice versa, that was the theme, plus their male relationships, both good and awful reported. I was born in London, but grew up in Redditch, Worcestershire, attending grammar school there, living alongside the lovely River Arrow and wildflower fields. My diverse career has included public relations, employment agent, interior design, voice-over artist, scriptwriter, antiques, Shelter for the homeless, animal charities, Esther Rantzen’s helplines for children and the elderly, counselling and stress therapies. Interests include the arts, music, films, theatre, gardening, animals, British social history, concerts, literary festivals. I have acted in both serious and comedic plays. Adopted as a baby, I voluntarily now help others to trace their roots. I have two sons, who live both in France and England. Now residing in Cheshire, I have written and published poetry, comic verse, and my autobiography. 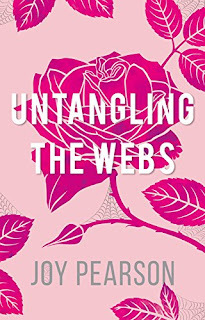 Untangling The Webs is my debut novel. When I am not promoting my book, I am working on the sequel to Untangling The Webs. Your books are written in Northern England. Have the people and the northern landscape shaped your stories in any way? From teenage years I have always loved Cumbria; some of my novel takes place there. I lived in Knutsford for some years, now Middlewich. More than half my book UNTANGLING THE WEBS, takes place in Cheshire. Villages are fictional names, Sandstone Village where a mystery is uncovered, is near Chester because of sandstone being local. As a writer based in the North, does this present any problems in terms of marketing and promoting your books and if so, how do you overcome them? None whatsoever because of internet and Facebook. Visiting various Litfests has helped – including Stratford, Cheltenham and Northwich. Visits to London for Damian Barr’s three writers events at The Savoy. If you were pitching the North as an ideal place to live, work and write – how would you sell it and what makes it so special? The motorway system going to all points is ideal. Houses are more reasonably priced than the south, although expensive in Knutsford, Alderley Edge, Bowdon, Hale. Still much countryside is unspoilt, flat Cheshire Plain and hills in Macclesfield, Congleton, Beeston Castle areas. Farmers markets everywhere, as Cheshire is a dairy county. Industry though is flourishing. Writing is a solitary business - how do you interact with other authors? I had to do it on my own, then met through Northwich Litfest, other writers briefly, attending their talks. Advised by one that my novel was double the size it should be. Worked to reduce it – took many months. Asked questions of one writer friend, as layout different from the older fiction books I have. I have recently joined Cheshire Book Connections, having secured a talk and signing event in Knutsford in November, then Cheshire Connections, a networking group of ladies with a variety of careers and talents. How supportive are local communities to your writing, and are there ever any opportunities for book shops, local reading groups, or libraries to be involved in promoting your work? I sent e-mails with attachments to Waterstones in Cheshire, Worcestershire and Yorkshire. Some were very accepting, some not, some no replies. Independent bookshops have taken some books. Local reading groups disappointing as no replies to e-mails or phone calls. Library book groups, have not wanted to buy my book as it is already in their libraries. One U3A group locally and one in Worcestershire promised an hour but stopped me after half an hour as said they needed to discuss their own chosen book. Consequently I sold only two books. At other talks though people have been more attentive, loved my book and bought signed copies.